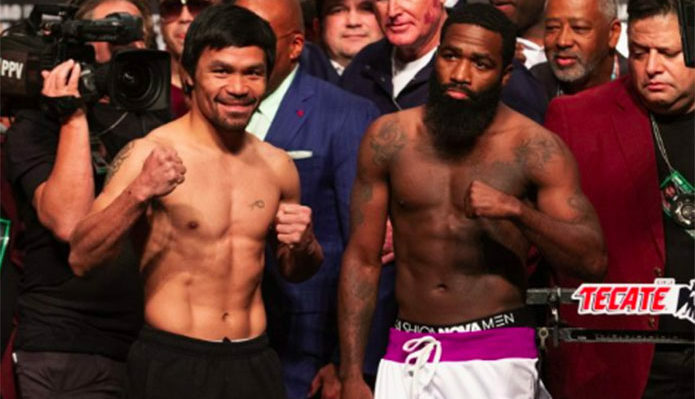 Pacquiao vs Broner – The much-awaited boxing match between Manny Pacquiao and Adrien Broner will happen on Saturday night, January 19, 2019. Filipino boxing champ Manny Pacquiao (60-7-2, 39 KOs) returns to Las Vegas to fight for the WBA “regular” welterweight title against Adrien Broner (33-3-1, 24 KOs) at the MGM Grand Garden Arena, Saturday, January 19, 2019 (Sunday January 20 Philippine Time). Where to watch the Pacquiao vs Broner Fight? The event will start broadcast Live at 7am local time on Showtime PPV the US. Local channels in the Philippines including ABS-CBN, GMA Network, The 5 Network, Solar Sports, Cignal and Sky Sports are expected to air the fight live. The Pacquiao vs Broner match is also available to watch online via Showtime live streaming channel. Keep locked on this page, live stream video links, result, winner and highlights will be posted below during Pacquiao vs Broner boxing match. Who do you think will win? Manny Pacquiao or Adrien Broner? Write your prediction on the comment section below!